It seems like once a year I go through this phase where I can't stand my hair anymore and have to do something drastic with it. Anyone else get like that? This time I opted for the Katie Holmes bob and chopped off about 7 inches. The bangs were a little different for me but not entirely new. 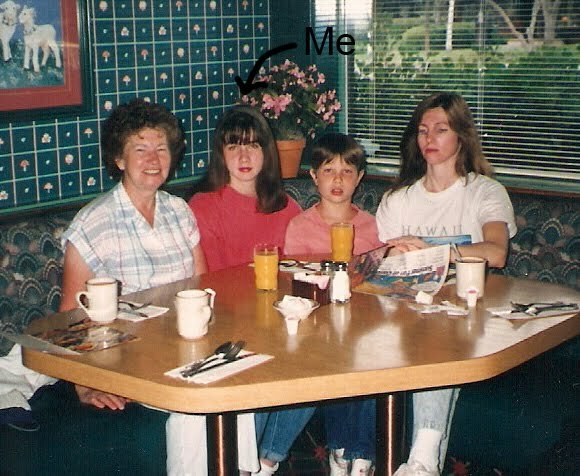 In junior high I once rocked the 90210 Brenda haircut which I thought looked good at the time. However, now that I'm looking at this picture, I'm not so sure (picture below). So, now it's been two weeks and I'm still not sure what to do with this hairstyle. What do you guys think, keep it, grow it out, ditch the bangs? P.S. Aren't you glad you stopped by today to read this riveting post *sarcasm*. I have this problem too. I was hating on my hair over the summer and chopped it off. now I'm trying to reach the bob stage -- like Keira Knightley's new look. Anyway, maybe you should try something a little more severe -- like a Louise Brooks length and straightness -- to add drama and a little edge. Just a thought. Good luck! I have yet to take a photo of me with my week and a half old haircut! I thought I'd like my hair longer -- after looking at celebs my age, I thought long hair looked nice. but not practical. 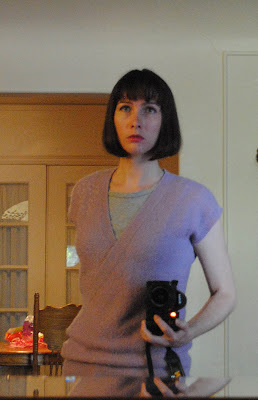 I love Louise Brooks look but I don't know if I'm that daring. My hair has never been that short before. That's how I felt about my long hair, not practical. I never had the time to style it properly and instead always ended up sporting a ponytail. How short did you cut your hair? I think you look really pretty. What about shortening the bob a bit? Perhaps above the chin? I think you look absolutely striking. I'm solving my problem by getting a wavy perm this December. I always like how some volume does wonders to the look and it's easier to manage. All I know is that I've personally made some horrific decisions about my hair (cut and/or color) prior to starting my menstral cycle. Think about it: 12 bad, ill timed decisions totally influenced not by the moon or tides, but hormones. Tread carefully is all I'm saying. Shoot! Tell me about it! Last weekend I had this stooopid idea that I should dye my hair darker... it looks awful... severe... I wanna be blonder and 'have more fun' LOL Why do we do this?? I just went through this myself! Went the hairdresser & said "Change my hair." I'm sporting bangs now, too - trendy & I think they're a keeper for a while. It can always grow back, right? Saaaaaame hairstyle as yours except blonde. I have had it most of my life. I keep going back to it. Maybe you can let the bangs grow more and sweep it to the side for style. I think your hairstyle is okay but not to cover much of your cheeks coz you look skinny. I love styling my hair before but now that I have baby I prefer to just have it long so I can easily tie or braid it. I for one love love love your new style! Just over six years ago I got bangs for the first time since I was in elementary school... It took some time to get used to them but now I'm so happy with them. If you feel the bob is a bit too much for you, you might consider razor-cutting the ends; it softens the edge a bit (that's my style: bob between my ears and chin, razor cut). But I really do love your cut as it is--very stylish! I go through this every time I'm growing it out from a shorter style. I say grow it out! And if you really really want to change it up a bit, just add a few choppy layers so that it feels different, but the length stays the same.